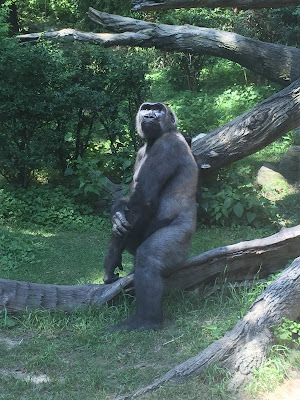 Gorilla as seen by daughter at Bronx Zoo this afternoon. According to Wikipedia, the DNA of gorillas is highly similar to that of humans, from 95–99% depending on what is counted, and they are the next closest living relatives to humans after the chimpanzees and bonobos. In any event, this gorilla makes a very handsome male model.